I’ve debated a bit about whether or not I want to post training updates this time around. This seems to be a normal part of a new cycle for me – do I want to share how my workouts are going, even (and especially) on the days when they’re not going well? Am I posting for myself? I’ve certainly had different answers to these questions in the past. And just as before, I’m a bit conflicted. For now, I’ll update when I feel like it. I like being able to look back on past training cycles. It helps put things in perspective, especially when you consider the training-LIFE balance that anyone training for a marathon has to deal with. I’m toying with the idea of posting monthly updates – surely, few people (if anyone) would read them but at least I’d be able to process what the heck is happening running-wise. Thoughts? Do you read training updates or do you scroll them? What do you think are the advantages or disadvantages of sharing? Last week was a transition week into my training for Monumental. I’ve been ramping up my mileage a bit in the past 6-7 weeks and I am happy that I was mentally ready to start a new cycle. Day 1 of training (although 16 weeks out was officially Monday, July 14) and I woke up feeling like absolute crap. I fought a cold/cough/sore throat over the holiday weekend but thought it had run its course. Turns out Monday was the worst of it and I spent half the day working in bed. I spent the rest of the day being lazy. But hey! I spent 30 full minutes foam rolling and using the roll recovery that night! After 10 hours of sleep, I woke up feeling human! I took plenty of meds and hydrated on Monday so I’m sure that helped a lot as well. The only time I had to run was during lunch so I ran 8 easy in a nearby park and ran straight to Potbelly for lunch. I took the long way there :). The surges felt great (turnover seems strong lately) and it was a good ‘light speed’ workout, considering the lingering congestion I was dealing with. Easy 10 on the lakefront this morning. It was a “cool” 72 degrees out, so it was pretty enjoyable. Seen on my run: Mr. Bean’s doppelgänger. I’m curious to see how these longer mid-week runs impact my training. Still a bit of lingering congestion, but much better than Monday! One word describes this race experience: woof. I jumped into a 5k just to see where my fitness is at before officially beginning the training cycle. I thought I could get to low 20s without blowing up. I’ve PR’d at this race the past two years and have liked racing it. This year, the congestion was terrible. The 8k starts 15 minutes before the 5k and they finish together on an out-and-back course. I was on target through 2-3k & felt pretty good – just starting to hurt but knew I could push for another 2k. After the 3k mark though, staying on pace was pretty much impossible. They didn’t put a race official at the turnaround to even let people know that a race was happening. There was plenty of traffic on the lakefront because it was such a beautiful evening. (The course is never blocked off but it’s never been a big problem in the past. In fact, I don’t even really remember any congestion last year.) This time around, there were cyclists on both sides and down the middle of the path – I was basically surrounded by bikes on both sides. And then, you run into the 8k runners that were running a much slower pace by the time the 5k runners were at the turnaround. There were more people running in the grass during a 5k than I’ve ever seen before and you could tell some people were frustrated. At that point, I literally had to stop and walk for a few seconds because it was so bad. Total of two stops probably totaled 15-20 seconds. Soooooo yeah, it didn’t go well. But I guess it was a decent workout. I haven’t done any structured speedwork since before Boston so at least I know I have a little bit of pep in my legs these days. I doubt I’ll be able to squeeze in another 5k in the next few months, but damn I really want that sub 20 goal knocked down this year. I know I can run a sub-20. I ran 20:05 at the same race last year. It’s gotta happen! The highlight was definitely hearing some familiar voices with 200 meters to go. Corey, Chanthana, and Manny were definitely the loudest spectators at the finish. We grabbed some burgers and beer after the race. NOMS! My legs weren’t sore or tired from the 5k at all. Derp. It felt good to move at the end of the work day. What a backwards Saturday. I woke up to a crazy downpour (think monsoon) at 6:30 AM and the rain didn’t stop until 11 AM. At that point, I was already preparing a late breakfast and debating delaying ’til tomorrow. After the rain cleared, Man and I headed out for our long run at 1 PM. Annnnnd it was sticky. And hotter than expected. If there wasn’t an annoying crosswind the entire time, I’m sure it would have felt much hotter. Ran easy 2 to the lake with Man and then ran 7:40-7:50 for the remaining 12. Stopped at plenty of water fountains and just took it mile by mile. Didn’t have much energy today despite 9-10 hrs sleep. Just happy to get it done and relax the rest of the weekend! Just a quick jaunt around the neighborhood in the evening. We drove down to 3 Floyd’s in the afternoon to pick up some friends that had biked the 35 miles there. We had a few beers and ate lunch – annnnd watched the World Cup on my iPhone. It turns out 3 Floyd’s has a policy against playing sports on their TVs (they always play movies?). & 1 cough/cold that went away! I read the training updates. Every single one. I like training updates! You’re brave to do long runs late in the summer heat. Whenever I’ve made those mistakes I’ve been terribly sorry (and my stomach hates me). 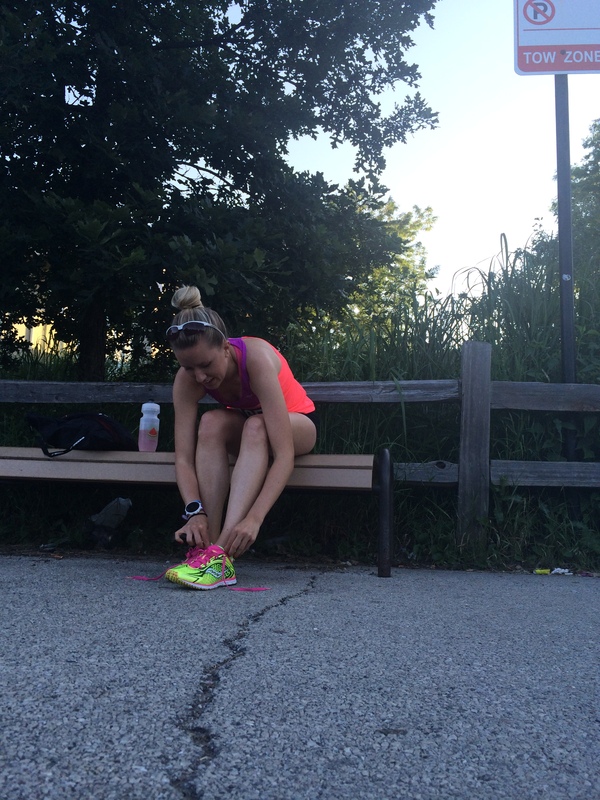 i don’t typically read weekly training recaps… just yours! have always enjoyed them. you should do what’s best for you! the readers that enjoy your blog will always be here! whether you recap training weekly, monthly or just by the training cycle. solid week of running, gal!